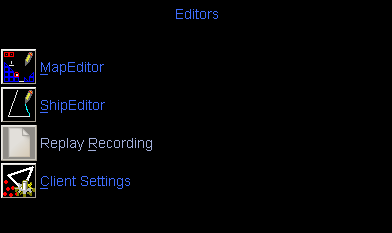 When you select the Editors button from the main panel buttons on the left, you are presented with a list of editors available. Here, you can customize your XPilot Battle Cruiser. Replay Recording is not supported yet and is greyed out. Replay Recording is an XPilot feature that allows you to capture to disk a game in progress and play it back later; kinda like a movie.